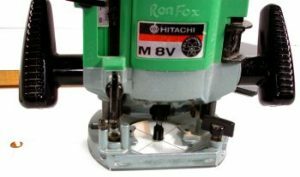 The insert plate adjuster system consists of eight threaded brass bushes let into the recess in the table top aperture. One bush goes into each corner and one in the middle of each long side. Fitting instructions are supplied with the plate. 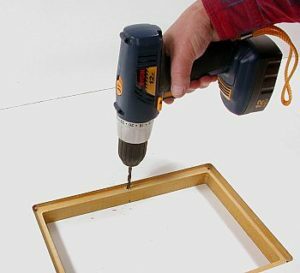 Insertion holes for the bushes are drilled with a 7/32″ drill bit. Photo 12 shows this operation. The bushes are then tapped into the holes until their tops are flush with the recess. This is done by screwing one of the steel corner-snugger screws into the bush and tapping in from above. I found it helped to finish by removing the screw and using a length of tommy bar as a punch. Photo 13 shows a bush on a steel screw being tapped in place. A tapped-in bush can be seen to the left of the one being installed. The insert plate fitting instructions suggest a table top thickness of 19mm, and the length of the nylon adjusting screws is based on this. My table top is 31mm thick so the holes for the adjusting screws must be counterbored from the underside of the top in order to fit the screws. 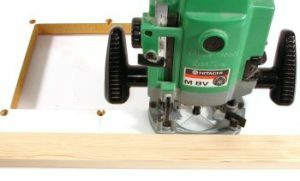 I counterbored the 7/32″ holes using the router with a home-made transparent plastic drilling base fitted to it. Crosshairs scratched in the plastic enable the drill to be positioned accurately and the drilling was done with a 1/2″ straight cutter in the router. I did the counterboring by eye but a batten can be clamped to the top to help with the positioning, if desired. Photo 14 shows the set-up drilling by eye, and Photo 15 the same job with the aid of a batten clamped to the table top. 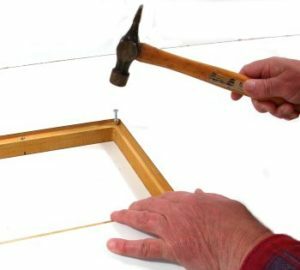 The nylon adjusting screws are fitted from the underside of the table top and final adjustment made with a screw driver. Photo 16 shows the adjusting screws fitted in the brass bushes. Final levelling will be done when the top is on the table and the router is fitted to the insert plate. This does not quite complete the table top. Fixing holes will be drilled for the fence adjusting bolts, a dust extractor/guard, and the horizontal pressure plate, but these will be done after the aforesaid items are made.